Ian MacDonald, Nick Anscomb, Nick Herd, Richard Marsh, Geoff Gowers, James Balfour, John Carder, Lynsey Archer and Liz Holding. Much appreciated! Claudio writes "Warwick Veterans 7 Old Sils Vets 4 ..In an end to end match Warwick outgunned the men from Solihull with Goals from Dave Astley 2 Chris Sampson 2 Phil Holding 2 and Dave Bryce .. Some quality hockey with the usual mishaps and we can't even blame the port this time!" Nick reckons.... "Badgers won 4-0 I think...! Fairly even game but Warwick always looked the stronger in testing conditions". (Let me know if this needs updating). Becky sends in "Hard fought 1-1 draw against North Staffs. 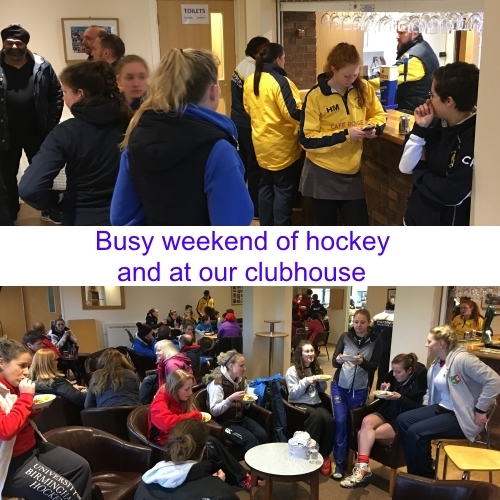 Positive performance to take into the coming weeks"
Ange reports "Great effort by the 2's who lost 4 - 2 to top of the table Hampton"
Hannah writes "Ladies 3s had a tough game against second in the table Edgbaston 3s. The match finished 0-6 (loss), but we played well with many positives to take away and an improvement on the previous score against this clinical side". Andy Griffin sends in "Ladies 4s battled hard but were outclassed by second in the table Warwick Uni. The 6-0 scoreline was a harsh reflection on the effort our ladies put in". Seb says "Warwick 1s frustrated to goalless away draw at Bridgnorth. The chances were there for the victory but none converted". Our 2s win 2-1 and climb to 4th place in their league, but suffer 2 injuries that could be telling. Langers is chuffed with "A very good 2-2 draw, coming back from 2-0 at half time, against top of the table and the best side we have played this season. POTM Nick Baker was solid in defense with goals from John Kane and Simon Shepherd earning us a share in the points". Nick sends in "4s battle hard against unbeaten Stourport losing 2-0, MotM going to Dave Morton for his endless workrate in midfield. Relegation battle in full swing now!" "Warwick 5ths draw 2-2 at Rugby with two goals by Man of the match Claudio Cardellino, "It's not about how many you score but when you score them and these goals probably mean survival " A very good battling performance with the 5ths coming back twice from behind" sends in Claudio! Rescheduled to allow for our U18 game the previous weekend. Bryce writes "Lost 2 0. Good team performance and good hockey but didn't convert possession into goals. Big push to end of season needed!" A much changed side due to injuries and a promotion to our 1s meant a big ask for our 2s in their second game of the weekend, particularly as Harborne did not play on the Saturday. 0-6 loss resulted as the fresh legs of Harborne overran our men.